I confess that I’m someone who doesn’t like headphones. Over the years, I’ve been exposed to all sorts of devices designed to remove the weird imaging inherent to headphones. The most successful ones (and I think particularly of the Smyth Realiser) make generous use of frequency dependent crossfeed. So it occurred to me that this could be something used here. 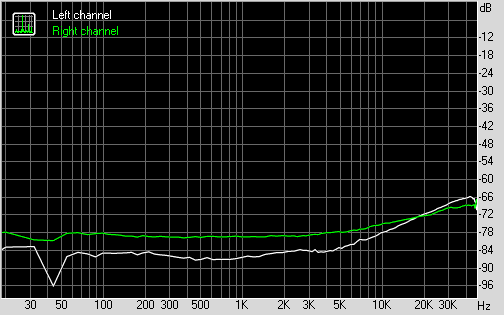 First, I did an electrical crosstalk measurement with headphones alone. The measurement is performed by sweeping each channel while measuring the voltage across the other channel. The crosstalk baseline is not spectacular, but sufficiently low that it is unlikely to be near any credible audible threshold. So crosstalk effects would have to be significantly higher to make an impact. Are there any? Here’s the same measurement, but with the REV33 Yellow inserted. 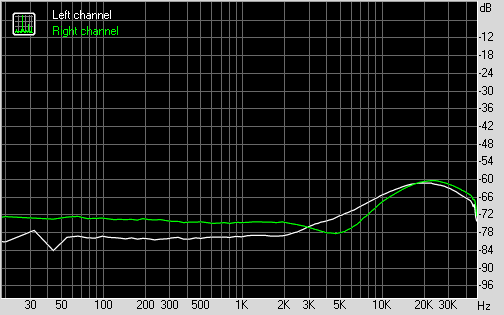 There’s slightly more crosstalk at the 10k-20kHz octave, but not so much as to seem deliberate- it’s about what you’d expect from stray coupling of two 4th order filters crammed into a small package. In any event, it’s in the not-likely-audible range. Nothing like the 0dB to -15dB crosstalk generally seen when generating these effects using other sorts of processing circuits or software. So far, it looks like what we have is a pair of simple 4th order filters. If you took $150 out of my wallet, I would definitely notice something after X number of hours too. It’s definitely not snake oil in the sense of, say, the Synergistic Research crapola in that it actually does something electrically. I did some follow-up measurements using the AP gear and AP’s headphone test fixture (these will show up in the April AudioXpress). Essentially, it’s a low pass filter. It also raises the source impedance seen by the headphones. I haven’t seen any peer-reviewed research that shows any of that to be an advantage or that it has any audible effect that plain old EQ wouldn’t, but it’s not out of the realm of possibility.